On May 17, 2009, at the spring undergraduate commencement, the newly renovated and expanded Saint Xavier University library was renamed "The Robert and Mary Rita Murphy Stump Library." 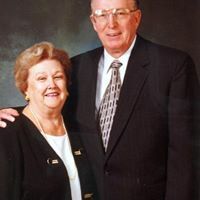 Mr. and Mrs. Stump's philanthropic spirit and affection for Saint Xavier University include real estate for the Orland Park campus and financial gifts, including a gift to the Mercy Endowment Challenge. 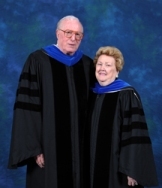 Robert and Mary Rita Stump also were honored with Doctor of Public Service degrees, honoris causa, during the 2009 undergraduate commencement ceremony. They exemplify the mission and core values of Saint Xavier University, and the University is honored by their historic support. Hassan S. Haddad, the seventh president of the Association of Arab-American University Graduates and one of its founders, passed away in Chicago in May of this year from a long-standing illness. As per his request, he was cremated and his ashes will be scattered in Bloudan Mountain in his beloved Syria. To all those who knew him, his passing came as a great shock. Husni, as he instructed us to call him, was not only an inspiration to us, he was also a mentor. If you were fortunate enough to have known him, you would agree that a great man and a gentle spirit has departed this world. Husni's name has been associated for many years with two great Chicago educational institutions, namely the University of Chicago and St. Xavier University. It was at the University of Chicago's Oriental Institute where he received a Ph.D. in the Humanities in 1962, and it was at St. Xavier University that he was Chair of the Division of Social Sciences for twelve years. He retired in 1996 as Professor of History. Both of these institutions, were enriched by his humanity, his rich scholarship and his towering intellect. Husni's scholarly interests covered a wide terrain, for example Arabic music, Eastern Christianity, Islamic studies, Asian religions, modern Arab history, and Arabic poetry. He continued to pursue his Arabic poetical interests through his activities with Chicago's Arab Cultural Club. He co-edited for the AAUG Press, with the late Basheer K. Nijim, a valuable reference work titled: The Arab World: A Handbook. He also contributed a piece to another work edited by Nijim, namely: American Church Politics And The Middle East.